Phlebotomy is a technique in which a needle is temporarily inserted into a vein to provide venous access for venous blood sampling. [1, 2, 3] Veins have a three-layered wall composed of an internal endothelium surrounded by a thin layer of muscle fibers, which in turn is surrounded by a layer of connective tissue. Identification of the optimal site for venous access (see Technical Considerations) involves both visual and tactile evaluation. After applying a venous tourniquet, the physician should inspect and palpate potential sites, starting with the nondominant extremity. On palpation, the vein should be soft and bouncy, it should refill after being depressed, and it ideally should be well supported by the surrounding tissue. Phlebotomy is commonly performed with either an evacuated tube system (eg, Vacutainer; BD, Franklin Lakes, NJ) or a syringe and needle or winged butterfly needle device (see Technique). 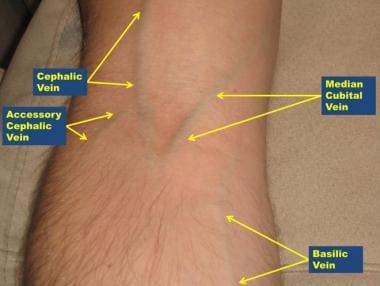 The superficial veins of the upper extremities, particularly those in the antecubital fossa, are the ones most commonly selected for phlebotomy because they are usually readily visible and easily palpable. 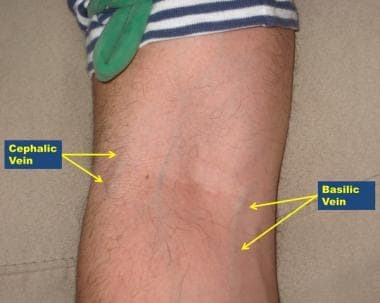 The antecubital fossa contains four veins (see the images below). 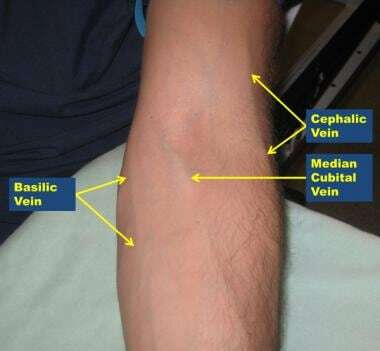 Of these, the median cubital vein is usually the vein of choice for phlebotomy: It is typically more stable (less likely to roll), it lies more superficially, and the skin overlying it is less sensitive than the skin overlying the other veins. Antecubital veins, right arm. Note variable anatomy; median cubital vein is not visible. 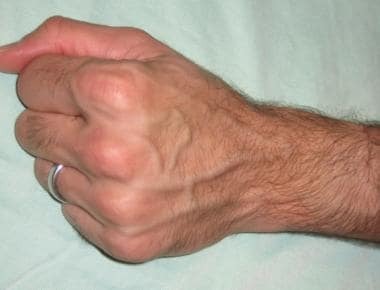 In many cases, the metacarpal veins are easily visualized and palpated (see the image below). However, obtaining needle access on the dorsal hand is more painful, and the metacarpal veins are more likely to roll and collapse on vacuum application than the antecubital veins are. Lavery I, Ingram P. Venepuncture: best practice. Nurs Stand. 2005 Aug 17-23. 19 (49):55-65; quiz 66. [Medline]. Phlebotomy. WebPath. Available at http://library.med.utah.edu/WebPath/TUTORIAL/PHLEB/PHLEB.html. Accessed: November 30, 2017. Ernst DJ. Flawless phlebotomy: becoming a great collector. Nursing. 1995 Oct. 25 (10):54-7. [Medline]. [Full Text]. Wollowitz A, Bijur PE, Esses D, John Gallagher E. Use of butterfly needles to draw blood is independently associated with marked reduction in hemolysis compared to intravenous catheter. Acad Emerg Med. 2013 Nov. 20 (11):1151-5. [Medline]. Phlebotomy. Assembly of Vacutainer(R) device. Phlebotomy. Insertion of needle (bevel up). Phlebotomy. Insertion of winged butterfly device. Phlebotomy. Insertion of winged butterfly device, flashback of blood. Phlebotomy. Holding device in place and filling tubes. Phlebotomy. Blood sample tube inversion. Phlebotomy. Application of pressure on straight arm for 5 minutes. Phlebotomy. Transfer of blood from syringe to vacuum tube.